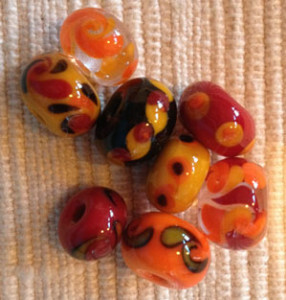 Once I became completely drawn to this new creativity I started the process of designing a studio space in order to create with this beautiful glass as much as I could. 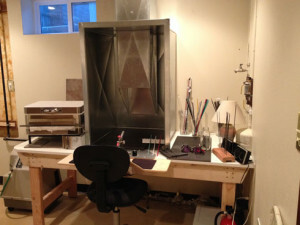 I found and bought a used kiln on Craigslist and started buying other equipment to start. I also spent A LOT of time on the internet researching what I was getting into and how to do things safely. Here is what the studio space looked like in the beginning – October 2013. 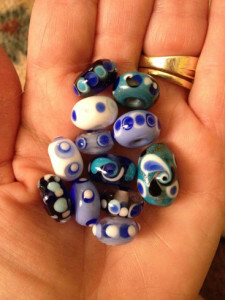 If you read my original post and/or “About” page, you know that I took my first lampworking class in mid-August 2013 and by October 1, 2013, I was already making my first beads in my own space! 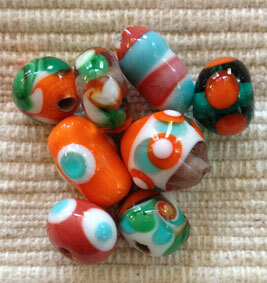 Once I had my studio space all set up, then I got going making beads. Here are some of my first beads made on my own. 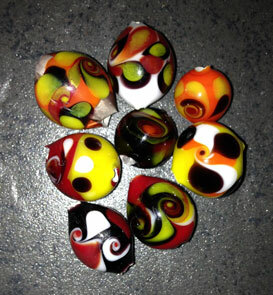 I joined a FaceBook group and reached out to other lampworkers to get technique tips on how to make more symetrical and donut/dimpled ends instead of sharp holes. I was having SO MUCH FUN learning and experimenting and creating!